The Best Place to Buy a Domain Name - With Training! 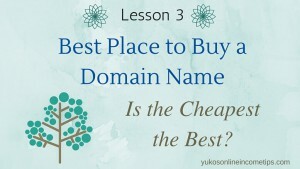 I often get asked by newcomers where the best place to buy a domain name is. There are so many sites that sell domains nowadays. People naturally get confused with too many options, and it’s kind of hard to determine what is a reasonable price for a domain name anyway. After all, it’s just a name attached to your URL, right? The cheaper, the better, isn’t it? You will find the answer to that question in this lessons. I’ll share with you where I normally get one, what’s included in the price and why I trust the company with my website domain registration. 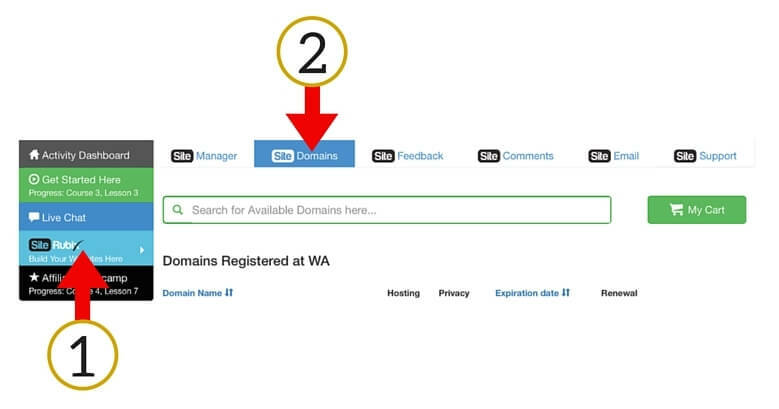 Quick Review: What is a Domain Name? A Domain name is what you see in the URL bar when you visit a website. For instance, when you visit Amazon, “amazon.com” is their domain name. It’s like an address that takes you to the homepage of the site. Unfortunately, NO. Buying a domain name is like buying a property. It comes with an address which you see in the URL bar (.com, .org, .net, etc.) and you have to pay money to own one. It’s not overly expensive, though, as a domain name usually costs $10 to $15 per year. If this is the very first time for you to create a website, you may feel like not investing any money at this stage, which is fine. 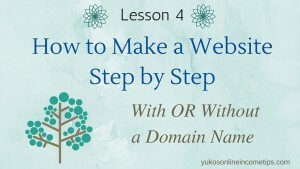 In that case, you can skip this step and go to the next lesson where I discuss how to make a website with and without a domain name of your own. However, the purpose of this tutorial series, Online Income 101, is to share with you every step of developing a brand new online business from scratch. So, I’ll anyway touch base on purchasing a domain name in this post. Read through this lesson and familiarize yourself with this particular process. You don’t have to apply it at the moment. Just come back to this lesson when you feel you are ready to buy a domain name for your website. 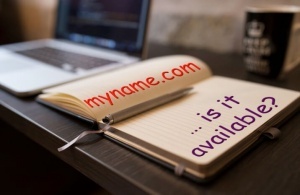 With or Without a Domain Name – What’s the Difference? The main difference of having your own domain name and not having it is how the URL of your website looks. What’s the big deal? The one with a subdomain is a bit longer but that’s about it, right? 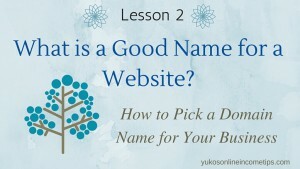 As I discussed in Lesson 2: Good Name for a Website, a domain name is like a virtual real estate. Once you own it, you are in full control of that entity. Nobody else can own the domain that you own. Know that there are around 140,000 new websites created EVERY SINGLE DAY. Meaning, domain names are being purchased one after another while you are reading this blog. Especially, the domain names with dot-com (.com) are super popular as they are most brandable and have commercial values. If you wish to run your website on a dot-com domain, I highly recommend not to wait too long to search for a name suitable for your niche and get it. After all, it costs you only $15 or less a year. Through previous lessons, I have walked you through how I picked a niche for my new website, Himalayan pink salt. I also explained what makes a good name for a website. I decided to name my site “Pure Pink Salt” because I liked how simple it sounds and also the phrase was available for a dot-com domain! I could successfully match the title and domain name for my new website. This wasn’t possible if someone had already owned PurePinkSalt.com so I was lucky. Once taken, a domain name is no longer available for you unless the owner agrees to sell it to you. This is why I urge you to check domain availability and if you find one that you like with dot-com, consider to purchase it sooner than later. Ok, back to the theme of today’s lesson: what is the best place to buy a domain name? Lets’ discuss what factors you need to consider when choosing a place to purchase a domain. There are a few different sites that I have purchased domain names in the past. Some of my old websites are still running on the domain I bought from those places. Initially, my favorite place was Namecheap.com. They offer various domain names at affordable prices and don’t have much upsells. But the downside of Namecheap.com, especially for beginners, is that they just sell you domain names. They do not provide any training. Purchasing a domain is not the goal of your business. It is merely a beginning. From there, you have to build a website, write content to attract visitors, sign up for affiliate programs within your niche so that you can start making money as an affiliate marketer. Mastering all these techniques is the real key to your online success. Unfortunately, Namecheap.com does not teach any of those techniques. Unless you are already familiar with creating a website that generates income, you will end up spending weeks (if not months) wandering around on the internet seeking information you need to run a successful website. I have experienced it myself and boy, it was stressful and energy-consuming! It is rare to find a well-organized learning course on the internet without paying hundreds of dollars. Wealthy Affiliate University is one of such rare places. They teach you the ABC’s of online marketing and beyond for only $47/month. It’s extremely underpriced for the quality of the education and support they provide. What’s more impressive is that you can access to their 20 beginner lessons as a free member. At first, I was getting domain names from Namecheap and training from Wealthy Affiliate. I now purchase all of my domain names from WA as their support system is unbelievable. They respond to your inquiries in a matter of minutes, not hours or days as it’s the case with many programs. I joined as a free member and completed 10 lessons of the Beginner Course without paying a cent. This beginner course itself gave me a great insight as to what I have to do to earn money through a website. This beginner course itself gave me a great insight as to what I have to do to earn money through a website. The differences between the two memberships are as seen below. You have to be a Premium member to purchase a domain name from Wealthy Affiliate. So if you cannot afford paying $47 a month at the moment, don’t worry about it. You can still set up a free membership and build free websites on a subdomain at Wealthy Affiliate. In that case, you don’t have to purchase a domain name. Be sure to sign up as a free member. No payment information required. Then you can start accessing 10 beginner lessons as well as video tutorials. I refer to their resources throughout this tutorial course, Online Income 101, so make sure you can access inside the program. I purchased the domain “PurePinkSalt.com” at Wealthy Affiliate University and here is every step of how I did it. Conveniently, Jaaxy and Wealthy Affiliate are linked with each other so all I had to do was to click “.com” listed under “pure pink salt.” Then it automatically took me to the domain register page at Wealthy Affiliate. NOTE: You don’t have to have Jaaxy to check what domains are available. Just log in Wealthy Affiliate, click SiteRubix > SiteDomain. Type in any phrases in the search bar shown below and you can check domain availability within Wealthy Affiliate. My new domain is $13.99. I did check out other companies too, such as GoDaddy or Namecheap, and “PurePinkSalt.com” was sold cheaper there. (a little over $10) But at Wealthy Affiliate, not only the domain but all the things you see below are included in the price. It’s way worth paying a few bucks more a year. Especially the support you receive at Wealthy Affiliate is priceless. 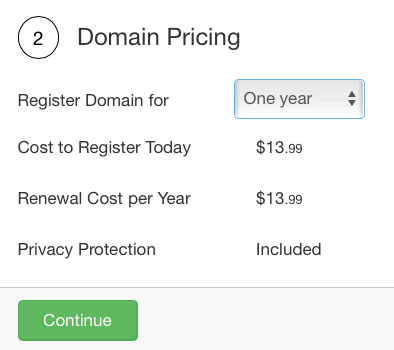 You can select how many years you want to register the domain. I selected one year. No need to choose more than one year as you can manage the auto renewal option within the system once you own the domain. Fill in your contact details. 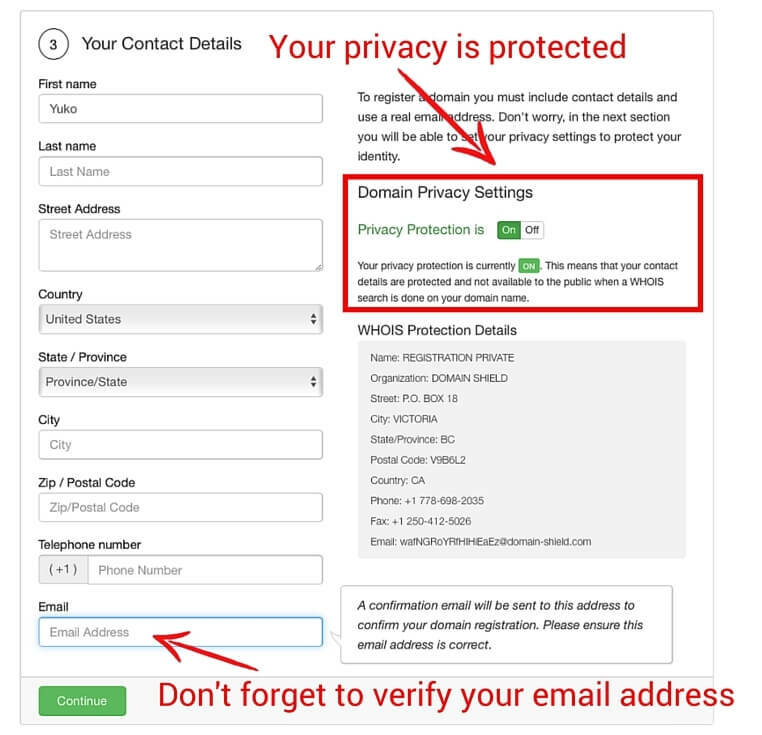 Privacy Protection is included in every domain you purchase at Wealthy Affiliate, so you don’t need to worry about your contact information being revealed to people who perform “WhoIs” search for the domain you own. Since January 2014, the Internet Corporation for Assigned Names and Numbers (ICANN) has made it mandatory to verify the contact information for all new domain registrations. For this purpose, Wealthy Affiliate will send you an email shortly after you complete registering a new domain name with them. Don’t forget to go and check your emails and verify your address to keep the domain active. You can make a payment via credit card or PayPal at Wealthy Affiliate. I chose PayPal. All I had to do was to click the PayPal button, and the payment process was complete in a few seconds. 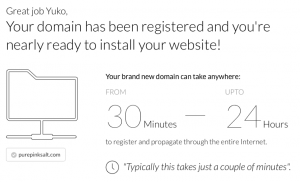 The “Congrats” message said that a new domain may take 30 minutes to 24 hours to register. But mine was active within a few minutes. I know this as a fact as I went to build a website for “PurePinkSalt.com” right after I completed the payment, and my new domain was already active and ready to use. I’ll explain this process of installing a new site to the domain name you own in the next lesson. 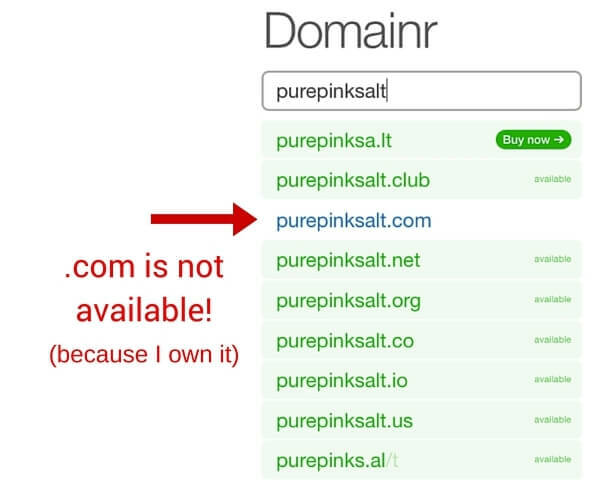 Out of curiosity, I went to Domainr (domain checking site) to see what they say about the domain “PurePinkSalt.” As you can see, it is no longer available for the dot-com domain as I now possess it. Owning a domain name is like owning a piece of land. Once it’s yours, you can start building a house (website) on it. No one else has the right to build anything as you possess the entire right to the property. Although having a domain name is desirable for your success, it is not absolutely necessary when you first start out. As mentioned earlier, it is also possible to create a website totally free on a subdomain. In this scenario, you can purchase a domain name later and transfer your site from subdomain to the new domain. Wealthy Affiliate University supports you through transferring too and makes the process super easy. It can be done with a few steps in the system. Purchasing an expensive golf set alone doesn’t make you a pro golfer. You need sufficient training, guidance, and support to become good at playing it, and it’s the same with online business. Instead, they guide you through the most important part of the journey; the actual process of building a business. They did teach me everything and now I am running websites that generate income. It’s still small but slowly increasing. Wealthy Affiliate does support you through AFTER you purchased a domain name from them. On this website, I NEVER recommend something that I didn’t try for myself and feel confident. I only recommend what I believe it would benefit you, and I can recommend with 100% confidence that Wealthy Affiliate is the best place to buy a domain name on the internet. Again, don’t worry if you are not yet ready to buy your own domain name. Let’s proceed to the next lesson where we finally create a website and you can do so totally free without having a domain of your own. If you have any questions or comments about domain names, feel free to leave them below. 6 Comments on "The Best Place to Buy a Domain Name – What You Need for Success"
NameCheap is my favorite place to purchase domain names also. They’re very affordable. However, you’re right about their specialization… it’s providing cheap domain names. For other services, it’s good to go elsewhere. One thing I will mention is you don’t have to purchase your hosting and domain name at the same place. For instance, you mentioned Wealthy Affiliate as a great place to get a domain name and hosting. An alternative for those who really like NameCheap is to purchase your domain name at NameCheap then join Wealthy Affiliate and change your DNS to Wealthy Affiliate. Sure, you can get a domain at one place and hosting at somewhere else. That’s how I started in the very beginning too. But for those total newbies who do not even know what a domain name and hosting mean (that’s how I was actually), I believe it makes the beginning of their online journey a lot less stressful if they could get those two things done in one place. I have never purchased a domain name from name cheap but know others who have. I have used go daddy which was reasonable. I do however, like the idea of Wealthy Affiliate University. It sounds good. Like everything is right there so I wouldn’t have go hunt for what I needed. I am going to do some research and then I will be back. Go Daddy is another popular place to purchase a domain for your website. I have used HostGator in the past, which I was not very happy with. To me, one of the biggest decision points with anything related to my website is the support. I didn’t receive swift and sufficient support at HostGator. (My inquiry was left unanswered over a week, and I am a very patient person). It’s completely opposite with Wealthy Affiliate. I would be happy if I get an answer withing the same day but the support team at Wealthy Affiliate usually replies in the matter of minutes, not even hours! I would highly recommend them for your domain names and hosting. They strive to keep your website secure and stable. I always use Namecheap to register my domains, I used to use GoDaddy but they are expensive and do not provide free WHOISGUARD which Namecheap do for your first year. I have also bought a name domain name from Wealthy Affiliate and I think their prices are similar to Namecheap. But I prefer Namecheap because they have more TLD’s and If I ever want to migrate my website to another host, I just have to change the DNS instead of transferring the domain name from Wealthy Affiliate to the new host which can be a tedious process. Thanks for sharing the info about Namecheap. That’s good to know! In that case, maybe Namecheap is a place to go due the flexibility we can have. I am still very happy with the Domain name experience with Wealthy Affiliate, though. Their support team is super fast to respond and helpful. Nothing can beat their level of customer service.